Need of a License: A real estate salesperson must be licensed by the state of Arizona to represent clients in the sale or purchase of real estate that is located in Arizona. Qualifications to receive a License: A candidate must complete 90 clock-hours of classroom study at an ADRE-approved real estate school (search schools here), pass a school-administered final exam, and pass a state exam. Distance learning pre-licensure curriculums are not permitted. All candidates need to submit a full set of fingerprints, prove legal presence and pass a background check. All candidates must be at least 18 years of age. For more information about qualifications, see Arizona Real Estate License – Qualifying for and Obtaining. Applying for the Exams: Candidates should apply to take the state exam through the Pearson VUE website scheduling page. Applicants must know the completion date of their pre-licensure curriculum, and the ADRE approval number of their pre-licensure school. (Search for ADRE approval numbers here.) More information can be found in the State of Arizona Real Estate Candidate Handbook. Test Content: The Arizona state real estate licensing exam is comprised of two separate tests, the national test and the state-specific test. Five questions on the national test and ten questions on the state-specific test are considered "experimental" questions and are not scored. Both portions are comprised of multiple choice questions with four answer choices provided for each question. Test takers are allotted 150 minutes to complete each test. A score of at least 75% is required to pass. The exam is presented in a computer-based format, but accommodations for paper-based tests and/or oral testing can be provided with special arrangements. How to Apply for the License: The license application is issued by the testing company upon passing both portions of the licensing exam. Candidates must provide ADRE with the following documents: (1) completed application and application fee; (2) original Arizona state real estate licensing exam score report(s); (3) proof of legal presence in the U.S.; (4) certificate issued by an ADRE-approved school for completion of the 90-hour salesperson pre-licensure curriculum; (5) if applicable, a Disciplinary Actions Disclosure form, along with supporting documentation; (6) Arizona Department of Public Safety (DPS) issued fingerprint clearance card. All of the required documents must be submitted to the ADRE offices in Phoenix within one year of passing the state licensing exam. Additional instructions for specific license applicants are in the ADRE Activating License Brochure. Fees: ADRE charges a license application fee. Who administers the test: ADRE and Pearson VUE. License Renewal Requirements: An Arizona real estate licensee must take 24 credit hours of continuing education (either online or in the classroom) from an ADRE-approved provider every two years. Further information is provided on the ADRE website, here. Applicable Regulations: Real estate licensees in Arizona are regulated under Title 32, Chapter 20, Real Estate. 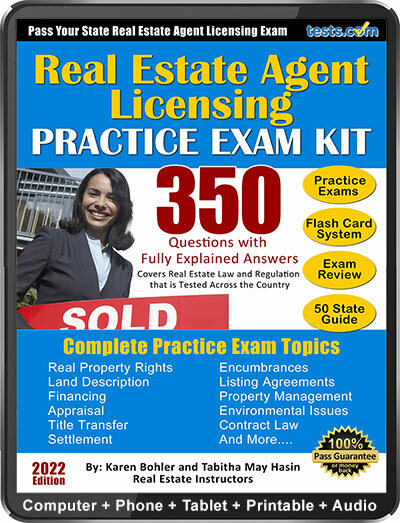 To prepare for your Real Estate Agent exam, use our 300 question practice test, with answers fully explained, by expert Karen Bohler. 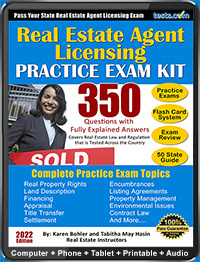 For more information on real estate agent licensing and exam preparation, go to Tests.com’s Real Estate Agent Test Guide and the Real Estate Broker Test Guide. 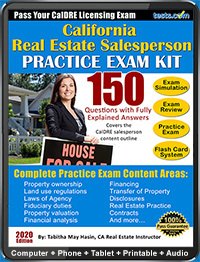 And take Tests.com’s free Real Estate Agent Practice Test and Real Estate Broker Practice Test. 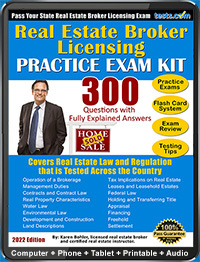 For real estate agent and broker exam preparation products, such as study guides, flashcards and courses, go to Tests.com’s Real Estate Agent and Broker listings.